Stormfall: Age of War is an exceptional game and it has many laudable interactive elements. Foremost among them is the fact that this MMO game actually unites people. Take the blossoming romance between two players – Tara and Glenn as a case in point. This is a story for the ages; a remarkable love story that knows no bounds. We would like to welcome you into a world replete with merriment, romance and pure bliss. This is the love story you've been waiting to read about! Hi Tara, tell us a little bit about yourself and Glenn. We’d love to know how you found out about Stormfall: Age of War. Glenn and I actually met in the game, back in the fall of 2012. The League that I was playing in at the time was Twilight Knights, and Glenn's League was the Wrecking Crew. As fate would have it, the two of us decided to strategize together, and we decided to develop plans to attack Castles. For example, I'd help him with Settlements and he would give me precious Resources. Suffice it to say, communication was paramount. We chatted, laughed and joked daily. It wasn't long before we decided to leave our respective Leagues and start up our own new League – The Silver Chalice. Glenn lived in the sunshine state, Florida and I lived in Pennsylvania. During the course of our gaming sessions, we started to talk about ourselves, our personal lives and it wasn't long before we realized we had lots in common. So we decided to take things to the next level – Skype. At 6 AM before work, we got online, chatted and laughed and shared good times and then every night we played Stormfall: Age of War for 3 hours. Exciting times indeed! How long did it take before you decided to meet in person? Well, after connecting with Glenn I didn't want to waste too much time. I decided back in December of 2013 that I would make the move to Florida. Since I would be turning 50 in July 2014, I was ready to start afresh with the man of my dreams. I packed up my worldly possessions, booked a ticket and flew down to Florida in March 2014. Would you believe that this was the very first time I ever met Glenn? It was surreal! As soon as I stepped off the plane and into the terminal I just knew he was the man for me. We had an incredible connection from the get go. He was waiting for me with a lovely bottle of wine and 2 glasses. We were so enchanted by one another's company that we just sat there in his VW convertible at the airport reminiscing about life and our upcoming journey together. I actually had my own residence in Florida, but within a month I decided that Glenn was right for me and I moved in with him. Nowadays, we play Stormfall together every single morning. Of course, I need my daily dose of coffee to get started but once we’ve logged in, our gaming sessions typically run between the hours of 4 AM and 9 AM. What aspects of Stormfall: Age of War do you enjoy the most? What brings you back time and again? Without a doubt, the Battlegrounds are my best part of the game. I'd even go as far as to say that I've mastered them. I get most of my units and resources from them. For Glenn though, things are a little different as he prefers constructing his Castle from scratch. Could you share with us a little about your daily routine in Stormfall? My daily routine is a mix of Raiding, Building and Daily Quests. As you know, I prefer Battlegrounds. There is so much excitement in this game, and we've made so many terrific friends around the world it's fantastic! I'd also like to thank you guys for adding in the option to relocate Castles – my Castle now sits beside that of my husband. Would you like to share a little about your future plans? Holidays and travel! That's pretty much what our plans are moving forward. We are now happily married and where better than Florida to take amazing cruises? Naturally, we're going to continue playing Stormfall as we’re both determined to get to level 100. 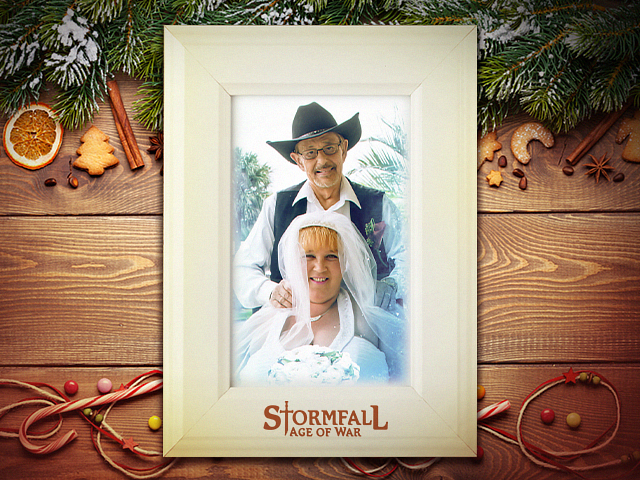 Join Tara & Glenn and many others in Stormfall: Age of War now!